What stunning talent, what staggering dexterity was on display here tonight. 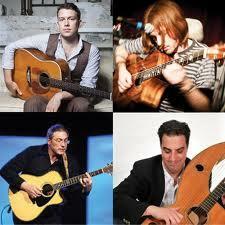 Four international gentlemen of the acoustic guitar delivered virtuosity with a punch and many more subtle touches. One felt it would have been rude not to have attended. Phew! The audience was genuinely appreciative, not account of the players' reputations but on account of performances that consistently impressed in no uncertain terms.